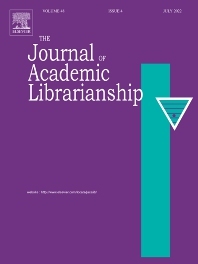 The Journal of Academic Librarianship, an international and refereed journal, publishes articles that focus on problems and issues germane to college and university libraries. JAL provides a forum for authors to present research findings and, where applicable, their practical applications and significance; analyze policies, practices, issues, and trends; speculate about the future of academic librarianship; present analytical bibliographic essays and philosophical treatises. JAL also provides special features in each issue which include book reviews on subjects of interest to academic librarians, information on academic library technology issues, research in international librarianship, digests of special reports, and a guide to sources and analysis of library metrics.